Conceal the secrets of the Chi War from the prying eyes of your players behind a wall of mystery and knowledge! 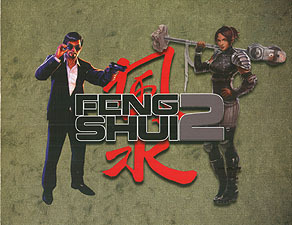 This heavy-duty three-panel screen also contains the most important reference material from the Feng Shui 2 core book, to keep your game running smoothly. Included with the GM Screen is A Fistful of Fight Scenes. This 32-page booklet presents 15 locations in which to set dazzling battles between your players and nefarious factions of the Chi War. Thrill to such cinematic classics as Nightclub, Ancient Temple, Moving Train, Bamboo Forest, Tea House, Factory Floor, and Shopping Mall! Each location is packed with ideas for things to explode violently while the heroes show off their action movie moves.